The purpose of the Music & Gospel Arts Department is to create opportunities and resources that enhance the worship experience by utilizing the arts as a tool to bring people into a relationship with Christ. Harold Burgmayer assumed the role of Territorial Music and Gospel Arts Secretary for the US Central Territory in September of 2015. 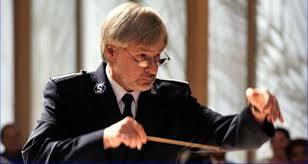 Previously Harold served as the Divisional Music Director for The Salvation Army in Eastern Pennsylvania and Delaware (Pendel Division) for 34 years. This included leadership of the Pendel Brass and Singers, who recorded sixteen albums and traveled to South America, Canada, the Caribbean, Scandinavia and throughout the US, including participation in the Rose Parade. At age 14, Harold began conducting and arranging music for his small corps band in Levittown, Pennsylvania, while benefiting from the music program of the Pendel Division under the leadership of B/M Kenneth Strehle and later, Ivor and Janette Bosanko. In the fall of 1973, Harold began architectural studies at the prestigious Cooper Union and was invited to join the New York Staff Band under B/M Derek Smith. The advent of Harold’s desire to pursue music composition coincides with a commitment to Jesus Christ made in the spring of 1977. Harold completed a Master and Doctor of Musical Arts degree in music composition from Temple University and has produced over 350 arrangements and compositions ranging from simple children’s songs to a symphony for full orchestra. Harold along with his wife Priscilla have appeared as guest clinicians, specializing in the training of young singers and instrumentalists. Numerous articles and instructional materials, including the Music Arts Proficiency (M.A.P.) curriculum, reflect the intent to develop music leaders. Harold and wife Priscilla have four daughters – Sarah, Kathryn, Carissa, and Erin are married. Five grandchildren, four boys, and one girl add their special charm to family gatherings. Peggy Thomas joined the Territorial Music & Gospel Arts Department in 1979. In 1976, Peggy became the first woman in the world to gain membership in a Salvation Army staff band. 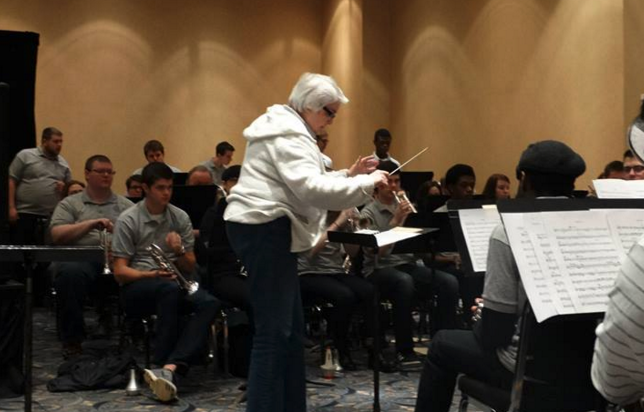 She served as principal cornet for almost 40 years and presently is the Deputy Bandmaster of the Chicago Staff Band. Peggy has appeared as soloist, clinician, and conductor throughout the United States, Canada, Korea, Netherlands, England and Australia. She has performed with the Colorado Philharmonic Orchestra as well as occasionally subbed with the Chicago Symphony, the Rochester Philharmonic, and the St. Louis Symphony. Peggy and her husband Scott are members of the Norridge Citadel Corps. Presently Peggy serves as the bandmaster of the Norridge Citadel Band, one of the outstanding brass bands in the Midwest. Since becoming bandmaster in 1983, she has produced 46 CDs with this band. She also serves as the head of the worship council at Norridge. Joe Caddy joined the Territorial Music & Gospel Arts Department in 2010 after serving four years as the Assistant Divisional Music Director in the Metropolitan Division. Before he came to work for The Salvation Army, Joe served as a public school choral director in Hoffman Estates, Illinois, where he also directed productions of LITTLE SHOP OF HORRORS and BYE, BYE, BIRDIE. 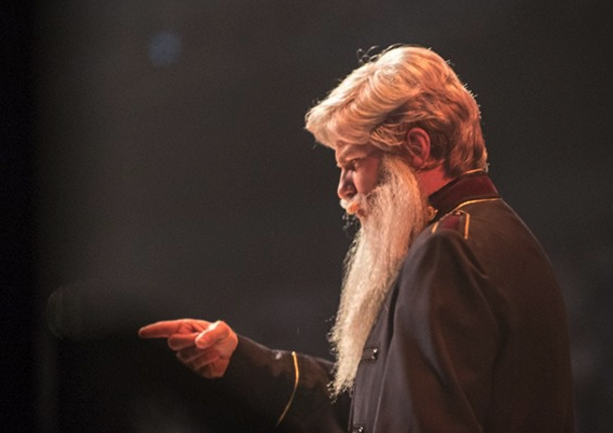 A founding member of The Salvation Army’s Bill Booth Theater Company, Joe has also acted as the troupe’s artistic director since 2002. Through the ministry of the BBTC, he has had the opportunity to perform for many varied audiences throughout the territory and around the Salvation Army world. In addition to his weekly instructional responsibilities at the College for Officer Training, Joe is an active guest clinician in both vocal music and the dramatic arts. Off of the stage, Joe is an avid reader, die-hard baseball fan and dedicated distance runner who completed his sixth full-marathon in 2016. Joe and his wife, Kristin, along with daughters Caroline and Eliza, are soldiers of The Salvation Army Oakbrook Terrace Corps in suburban Chicago. Lynda Cooper worked in the Midland Music Department as the Assistant Divisional Music Director for two years and as the Divisional Music Director for 22 years. While she enjoyed her work and colleagues, she especially loved working with the children and teens, teaching them how to worship through their music. Among her favorite aspects of her position were planning and production of music camps and music schools, as well as playing in ensembles throughout the year. After living in St. Louis for their entire lives, in 2015, Lynda and her husband, Ron moved to the Chicago area where Lynda serves as the Administrative Assistant to the Central Territorial Headquarters Music & Gospel Arts Department. It was through much prayer that the Coopers decided to make Chicago their home. Lynda has three grown children, of which they are very proud. They are blessed to have ten grandchildren, which are the light of their lives. Lynda and Ron currently attend the Elgin Corps, participating in the Band & Songsters and teaching children to play brass instruments. Beth Malovance joined the Territorial Music & Gospel Arts Department in 2017. Before she came to work for The Salvation Army, Beth served as an elementary general music teacher. In addition to helping develop and teach the elementary music curriculum, Beth led the choir and world drumming ensembles, taught guitar, ukulele, Orff and auxiliary percussion instruments and directed full musical performances on a yearly basis. 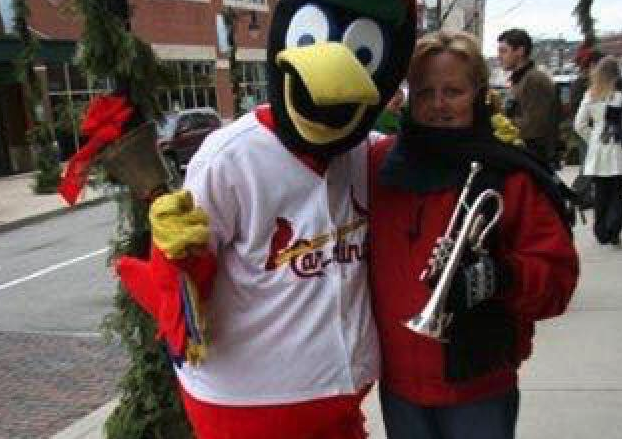 Beth is a Smith-Watkins artist and currently serves as principal cornet for the Chicago Staff Band and the award-winning Chicago Brass Band. She also plays at her Corps in the Norridge Citadel Brass Band and also with the Athena Brass Band. Beth has served as a Guest Artist for the International Women's Brass Conference, been a special guest at music camps and is a featured soloist here in the United States and abroad. Recently she has played with the esteemed Brass Band of Battle Creek. Marty Thomas joined the Territorial Music & Gospel Arts Department in 1999 after serving eleven years as the Divisional Music Director in the Metropolitan and Western Pennsylvania Divisions. His responsibilities are mainly music typesetting for the Hallelujah Choruses series and the American Festival Series and the creation of drama resources for the Central Territory. He is a member of the Chicago Staff Band and the faculty of the Central Music Institute. He is passionate about music camps and youth music within The Salvation Army and has been involved in the teaching of Steel Drums (Pans). He is currently the Songster Leader at Norridge Citadel, where he also served as Youth Band leader for over 10 years. He has been very active in the Drama ministries at his corps, writing scripts for various worship series and contributing to the yearly outreach, Come to Bethlehem. Marty is married to Monica, and they have two adult sons: Zachary, a graphic designer in Englewood, Colorado, and Jared, a student at Olivet Nazarene University. Brett Tolcher joined the Territorial Music & Gospel Arts Department in 2015. Being a member of both the Resource Connection and Music & Gospel Arts teams, Brett is responsible for the publication, marketing, and distribution of printed and recorded music. Prior to his tenure at The Salvation Army, Brett was employed at the Ann & Robert H. Lurie Children’s Hospital of Chicago for four years where we developed relationships with individuals to secure charitable gifts to support the pediatric healthcare and research. 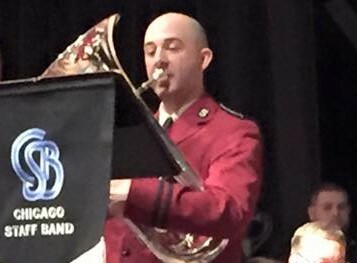 Since 2007, Brett has been a member of the Chicago Staff Band where he currently plays Principal Trombone. Brett completed his university studies in Trombone Performance at DePaul University under the teaching of Charles Vernon (Chicago Symphony Orchestra) and Mark Fisher (Lyric Opera of Chicago). Brett also plays piano/keyboards and has been featured at the Boundless International Congress in London and the Chicago House of Blues. Brett is a soldier at the Norridge Citadel Corps where he serves in the senior band and praise team. Josh Turner joined the Territorial Music & Gospel Arts Department in 2016. Before he came to work for The Salvation Army, Josh served as a music teacher in public schools for 7 years as a choir director, beginning band director, and general music teacher. Prior to teaching Josh had previously worked in the Music and Gospel Arts Department as the music intern under William Himes during the summer of 2007. Josh is an active member of The Chicago Staff Band since 2006, playing Baritone, Eb Bass and now Principal Euphonium. Through the ministry of The Chicago Staff Band, he has had the opportunity to perform for a variety of audiences across the world. Josh along with his wife Helena and two children, Declan (born June 2013) and Grace (born March 2016), are members of the Norridge Citadel Corps. Presently Josh serves in the senior band, is a member of the worship council, leads the praise team, and leads the ukulele class at Norridge.